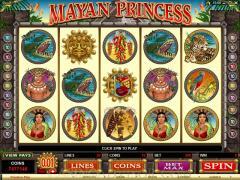 Mayan Princess is video slot from Microgaming. It has 5 reels, 20 paylines and a maximum bet of 200 coins. The slot has an Ancient Civilization theme and brings alive the fierce and vibrant culture of the Mayans in their exotic and wild surroundings. The symbols on the reels are carefully chosen to describe every facet of the bygone era. These symbols are Priestess, Warrior, Leopard, Crocodile, Parrot, Sun Mask, Bird Mask, Corn and Pepper. The Mayan Princess Logo is the wild symbol and the Pyramid is the scatter symbol. The Pyramid symbol activates the free spins bonus round. Before starting the game players will have to choose the coin denomination by operating the +/- signs below the coin denomination button. Coin denominations are 0.01, 0.02, 0.05, 0.10 and 0.20. Players will also have to enable up to twenty paylines by operating the +/- signs below the LINES button. Winning combinations pay only if they occur in enabled paylines. Finally players will have to choose the number of coins per line by operating the +/- signs below the COINS/LINE button. 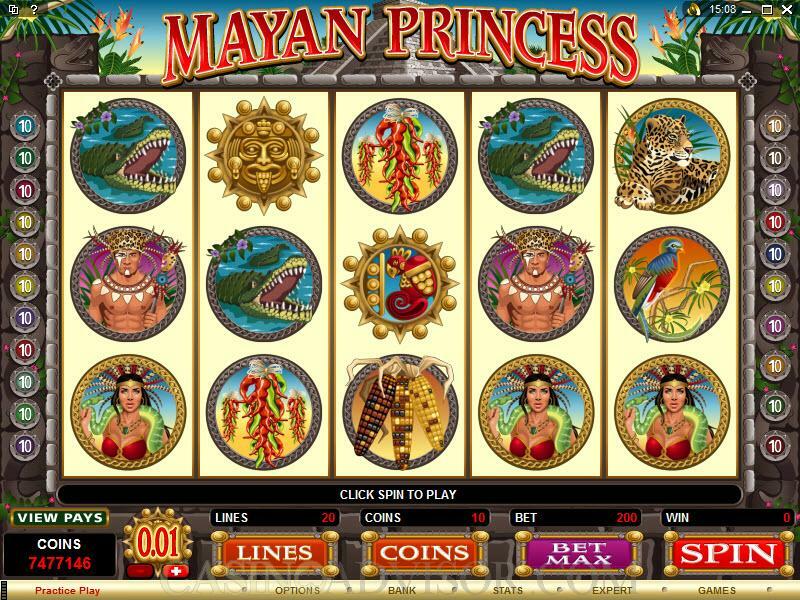 In Mayan Princess, players can wager up to 10 coins per line. Once the settings have been completed the game can be started by clicking the SPIN button. The Mayan Princess Logo is the wild symbol. 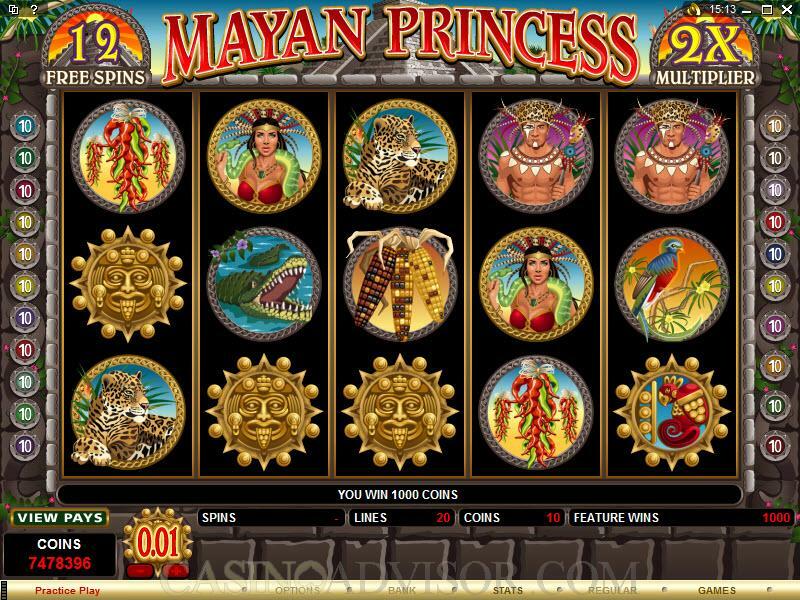 Unfortunately it does not multiply payouts but it does offer a fixed jackpot of 5000 coins when five Mayan Princess Logo symbols appear in an enabled payline. The scatter symbol is also usually important to the theme of the online slot game and nothing can be more important to the Mayan culture than the Pyramid, which was the hub of its religious activity. The scatter symbol does not offer any payouts but the symbol appearing simultaneously anywhere on reels 1 and 5 activates the free spins round. Between 10 and 20 free spins are offered at doubled payouts. The free spins round can be re-triggered. The maximum bet in Mayan Princess is 40.00, with achievable rewards as high as almost 16,510.00 in the base game and up to 33,020.00 from Free Spins. All the animations are too numerous to describe. Some of the better ones are the Crocodile opening wide its jaws, The Corn cob shedding its seeds and the sun rising from behind the Pyramid. 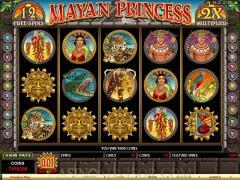 It is beyond doubt that Mayan Princess is one of the slicker online slots from Microgaming. But it may not become as popular as it could because of the low payouts. Interested in reading more detailed information about Mayan Princess? If so Click Here for more details.